You can plan a holiday smarter and easier using the right tools. We'll soon be embarking on our holiday to the US - but other than a general idea of where we're headed and some major activities, we haven't planned much of our itinerary. At the same time, we've been planning a holiday to New Zealand for 2018/2019. Our holiday to New Zealand will be a road trip, so this will require more meticulous planning - we need to know where we'll be driving to, how long we can take, what we'll do there (roughly) and rather importantly, ensure we have accommodation and catch our flights. The TripIt Android app on the left, and the Googly MyMaps Android app on the right. Read our full review of the apps here. We chose TripIt and Google MyMaps because they're helpful for planning a trip, as well as available cross-platform. This means you can use TripIt and Google MyMaps on any internet browser, or as an app on iOS/Android. You can read our review of TripIt and Google MyMaps here. Whether you've got a detailed travel itinerary, or a more simple plan, you can use technology to enjoy travelling smart! Here's a general guide on how to plan a holiday, using smart apps, based on our own experience. With the features and shortcomings of TripIt and Google MyMaps in mind, we used both services hand-in-hand for the best travel planning experience. We'll be visiting the US at the end of this year. For this trip, we'll mainly be based in major cities for 4-5 nights each (or based in a theme park hotel), so it's not much of a road trip. Most of our transport will be via public transport, other than a drive to Yosemite National Park. Because of this, there's less "intense" or meticulous planning involved. Other than major activities that have to be booked in advance (like musicals/plays and popular restaurant reservations), other activities can be more spontaneous and depend on the conditions that day. TripIt is helpful for providing details related to your booking confirmations: to the left is our hotel details, and to the right is our car rental details. TripIt can also pull out details about your activities for you - this one is from our booking confirmation for a musical on Broadway. Where additional details had to be added, we easily added plans to TripIt, and we now have a neat itinerary for easy reference when we travel. We're also planning a holiday to New Zealand at the end of 2018. New Zealand is a lovely country for a road trip, which requires more meticulous planning (you don't want to end up stranded and missing your hotel after it gets dark). But prior to that, you'll first need to know what you're going to do. So we had to do some research for a general idea of what to expect and look out for. After some Google searches (which involved reading a number of blog posts online) and inquiries with friends who've been to New Zealand before, we settled at a general plan - flying from Singapore to Auckland (in the north island of New Zealand), then taking a round road trip (through Taupo, Rotorua and Coromandel) before returning to Auckland after a week. Thereafter, we'll fly to Queenstown and take a road trip to Christchurch (through Wanuka, Mt Cook, Fairlie and Arthur's Pass) before flying back to Singapore. You can use TripIt to create "directions" between 2 destinations - this helps with planning (and estimating distances and the time of arrival), and is also useful during a trip itself. Based on what we've read online, the actual time required is usually longer than Google Maps' predictions, because of constant stops for photo ops (because of the beauty of New Zealand) and also because tourists usually drive slower for safety reasons. We kept this in mind when planning distances between destinations. Once this is done, you'll want to add "directions" in Google MyMaps for each destination you'll be headed to. This creates a series of routes on the map that helps you when planning your accommodation and activities. It also helps you visualise (very roughly) distances between 2 locations and whether or not the route is feasible. For a quick and easy visual reference for driving routes and distances, Google MyMaps comes in handy. TripIt can't automatically create a route for you, simply because there are no booking confirmation emails if you're on a road trip. Though if you have booking confirmations for internal/domestic flights (or high value train trips), then TripIt will create the relevant plans for you in the itinerary and timeline. You'll want to add "directions" in TripIt for major routes on your itinerary. So, for example, we're driving from Auckland to Taupo on the 2nd day of our planned trip to New Zealand. We'll add directions from the city centre (or from our hotel, once we've decided on one) of Auckland to Taupo. Since we're stopping by Waitomo, we'll also include that in the directions. You can also insert the start time, and TripIt will give you the estimated travel time, so you can roughly gauge when you'll reach your destination. TripIt directions come in handy later on when you're planning your trip and want a more accurate reference than simply the visual representation on Google MyMaps. Having found attractive destinations (like Rotorua, Taupo, Wanaka, Queenstown etc.) with our online research, we next had to ensure these locations had good and affordable accommodation. We preferred not to sleep in a campervan for the road trip. Our favourite way to choose hotels (or other lodging) is by checking out real user reviews. User reviews are more "accurate" when it's confirmed on a large scale - so, for example, if you read one online blog that said a hotel was good, it's possible that the hotel was only good for that one person. But if a lot of users confirm that the hotel is good then, statistically, chances are that the hotel actually really was good. You can sort by "Traveller Ranked" on TripAdvisor to see which hotels have the best user reviews. TripAdvisor has a wide variety of accommodation, as well as a very large base of user reviews. For this, we usually turn to TripAdvisor and Booking.com because of the huge list of accommodation, as well as the high volume of user reviews. We'll go to both sites, key in the dates we'll be there, and search the destination where we plotted out in step 2 above, then sort the accommodations based on user ratings. So for example, for Auckland, we searched this on Booking.com. You can also sort by "Review score" on Booking.com. Although there might be nothing wrong with hotels with very few reviews, generally, you'll want to look for hotels with a larger number of reviews (preferably with at least 150 reviews). It's important to note that, when sorting based on user review scores, TripAdvisor and Booking.com simply take the average of all user reviews. This isn't necessarily useful because some hotels are so obscure (or so new) that only a handful of people reviewed them. Because of this, you can't be certain that the high score is (statistically) accurate. Accordingly, I usually ignore the high scoring hotels with very few reviews. What constitutes "very few reviews" depends on the nature of the location. In bigger/more popular cities like Auckland or Queenstown, there'll tend to be more user reviews, so we'll ignore accommodation with less than 50 reviews, and usually look at hotels with 150 reviews or more. In smaller or less popular locations, even 20 reviews might be sufficient. Next, we look at the price - it's pointless booking a really well-reviewed hotel way out of our budget. It's important to look at photos of the hotel to ensure the style is to your taste. Finally, we look at the location, see traveler's photos and read a sample of recent user reviews. The location is important, particularly if you're traveling by public transport. You'll want to be within walking distance (preferably less than 5 or 10 minutes walk) from the nearest train station (or other form of public transport). You'll also want to be in the city centre (if you're staying in a city), otherwise you'll be wasting time everyday traveling back and forth. TripAdvisor usually has more traveler's photos for each hotel - these photos are very, very helpful to check out the actual condition and style of the hotel. Traveler's photos are important because different people have different preferences. You might find a hotel with very good reviews, but the style of the rooms might not be to your taste. Also, traveler's photos are important because they're a more accurate representation of your accommodation - the professional photos taken by the hotels themselves almost always look better than reality. And finally, the user reviews let you know what dealbreakers to look out for - they tend to point out the negatives that they faced. If it's something that resonates with you, you can take that into consideration. They might also give tips on what to look out for. There was one particular hotel we found where all the reviewers raved about the provided free breakfast - so you know what to do when you're staying there. User reviews are helpful to spot dealbreakers and let you know what to look out for. Booking.com's review format allows reviewers to add a "negative" (the grey subtract sign) and a "positive" (the green addition sign) section, for easy reference. With all of these in mind, we'll try to make a booking for the hotel, preferably with the option for free cancellation (even if it costs a few dollars more - it's usually worth it). TripAdvisor has a different user review structure, but usually has more reviews (which are more wordy/comprehensive). On a random note, we prefer making our bookings with Booking.com because we get "cashback" from Shopback, but more importantly it's also because the website always shows the final price you pay, with no hidden costs. In the past, we used to look at all the popular booking sites (and there are a large number of them - Expedia, Agoda, Hotels.com, Trivago, TripAdvisor and Booking.com etc.) and compare pricing. Sometimes, the prices on the other booking sites looked more attractive, and we went down the route of booking the accommodation. But after 5 minutes of clicking and selecting, we found that the final price was higher than the displayed price because of taxes and other charges. When we compared these prices to the Booking.com price, we found that the Booking.com price was equal to, or cheaper than, the final price. Because it's difficult to estimate the actual, final price for the accommodation based on the displayed price for those websites, we ended up simply sticking with Booking.com because we were lazy (we found that in general, even without the "cashback" from Shopback, the prices of Booking.com were very competitive. Of course, this is just our anecdotal experience). Of course, if you have the time and motivation, it is always better to compare the price of each hotel with every other booking site. Just remember to fill in all the relevant details and click through all the details until you reach the confirmation page (before paying) - because the displayed price on the first page might not be the final price for all booking sites. You can also book private residences/apartments through Airbnb, which is usually cheaper, but we tend not to choose these options because you may feel like you're sleeping in "someone else's bed". A note on Airbnb: You can also book accommodation from Airbnb for many destinations. Airbnb is usually cheaper because it's a site that offers rentals from peoples' apartments or homes, and not actual hotels. We personally tend not to rent from Airbnb because we usually prefer the service from hotels (particularly the daily cleaning service) - staying in Airbnb apartments can sometimes feel like you're staying in someone's house (because that's exactly what it is) and that might not suit your preference. If you're using Airbnb, be sure to look out for high user reviews for the particular place you're renting, because less reliable operators might mean you end up with nowhere to stay when you've arrived in the foreign country. Once you're done with your bookings, you'll get confirmation emails. 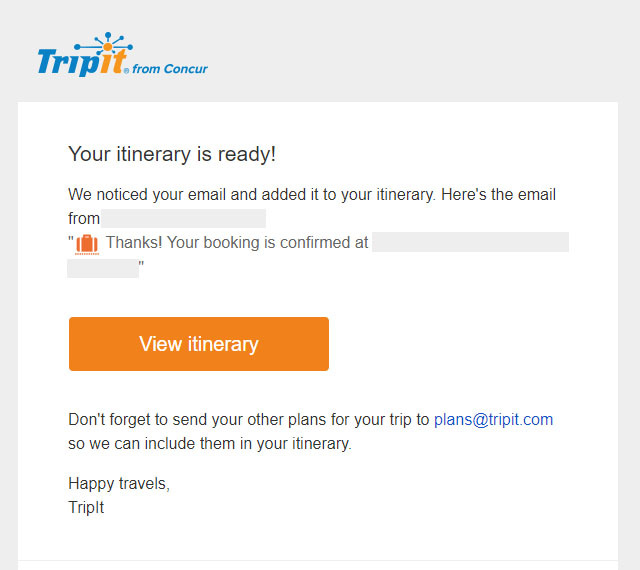 You can either forward these emails to TripIt, or turn on the option for TripIt to automatically pull out the details from your email. After this is done, TripIt will neatly organise your accommodation plans in a timeline, with all the details you require included inside. It's fast, efficient and a helpful reference. Once you've booked your accommodation, TripIt can automatically detect your email booking confirmation and add the accommodation (together will all essential details) into your trip itinerary. For Google MyMaps, you'll have to manually add each hotel as a "marker", then change the relevant icon and add in any additional details you may wish to include. It's worth the trouble though, because when you need a quick and easy visual reference, Google MyMaps is very useful. It's important to be sure of how you'll be getting around on your holiday. It would be an absolute disaster if you had a neatly planned itinerary, but couldn't get from one destination to the other - this would throw off all your subsequent plans! This is especially important if you're travelling during peak holiday season (for example, during summer in New Zealand). Car rentals and flights can get exorbitantly expensive, or maybe even fully booked out, if you attempt to make reservations too late. In destinations where road trips are popular, there are usually a wide variety of different car rental companies, some more established than others. Be sure to do your research and search the internet for affordable and reliable transport options - there'll often be ranking websites (with user reviews) for most transport rental companies. This is important because some vehicles (from the less reliable rental companies) might be run down or even stop working midway through your trip, which would be an absolute nightmare. When renting vehicles, we usually look out for the insurance policies with the most coverage, and rent the add on GPS device. While it may be more expensive, it's usually worthwhile for the peace of mind, especially since you'll be driving in a foreign environment. It's usually a good idea to choose the insurance policy with the most coverage (and zero excess). After you've planned or confirmed your transport plans, you'll want to add them to TripIt. You might already have added them under step 2 above, so there isn't much else to add here. You'll want to add "directions" between your destinations on TripIt for easier planning. Similarly, if you haven't already added your routes to Google MyMaps (under step 2 above), you'll want to do it now. You'll also want to add "directions" between destinations on your route in Google MyMaps. Your activities are usually the highlight of an actual holiday. But because of the nature of availability of such things, and the varied types of activities in any given place, there's usually less urgency to confirm these activities too far in advance. Of course, there are exceptions, and certain restaurants, musicals/plays or other activities can get fully booked months or even a year in advance. For these things, you'll want to do your research and ensure you book in advance to avoid disappointment. Research your activities, then add your plans to TripIt. For other activities (like most plays or musicals, spa appointments, extreme sports etc.) booking a month or two in advance is usually safe. Visiting museums and other places of interest also usually don't require advanced bookings, though your mileage may vary (be sure to do your research!). Flexibility in your actual schedule when it comes to activities is actually a good thing for most holidays. Sticking to a rigid schedule might ruin the fun, and conditions are constantly changing so some reorganising of activities might be required. TripIt can automatically pull out details from your email booking confirmations and add these to your itinerary. It's still useful to have an idea of what you want to do, and add these plans to TripIt as "activities" for easy reference when you're at the location. For better visualisation and planning of your time, you'll also want to add "markers" for these activities at their venues in Google MyMaps too and change the icons accordingly.